Pay-per-pound buffet foods are made to be heavy! The first few times I purchased food from these bars, I didn’t know any better. I loaded up their styrofoam container (the 3-partition one like in the picture above) with General Tso’s chicken, “sushi”, noodles and pineapple. I mistook this buffet for an all-you-can-eat buffet. But the strategies used to get your money’s worth at all-you-can-eat buffets aren’t the same as with pay-per-pound ones. Instead, you should use some different strategies, much like those to satisfy your tastebuds without expanding your waistline. When you’re paying $5-7 per pound, you want to get your money’s worth! First, while some of you will think all of the thought I’ve gone through here just shows how cheap I am, then you’re right. But while I try to save money at the buffet, I also try to go for things that will satiate my appetite. This is #1 because it’s the hardest to do by far. If any buffet manager knows his business, he knows to inject as much water into the foods as possible. Why? Because adding moisture is a cheap way to increase the weight. And since you’re paying by the pound, the more it weighs, the more you pays. Chinese food: For example, the General Tso’s chicken, sweet and sour chicken, lo mein noodles. Since the chicken is deep-fried, it absorbed all that grease. And then it’s stir-fried in the sauce that clings to it like honey. And those noodles are boiled (absorb water) and fried in more sauce. Put all that together and you have some pretty dense, heavy foods. “Sushi”: I put that in quotes because it’s not real sushi and barely substitutes for it. But everything they put in that roll is solidified with water: rice, avocado, fake crab, etc. If you want real sushi, go buy it at a real sushi bar. You’ll probably get 5x the amount for the same price, and of higher quality. Pasta Salads: Whether they’re made with mayo or oil, pasta salads are dense and heavy because of the water in the pasta and in the dressing. Plus, they add onions, olives, tomatoes and other weighty bits just to pack on the pounds. Things with Bones: Why would you buy chicken wings and fried chicken on the buffet when half of the weight (at least) is bones? You can’t eat the bones, so if you want chicken, go boneless. Fruit: Ok, I know this is probably THE only nutritious thing on the whole buffet, but hear me out. Fruit is like 95% water, and if you want to buy fruit, I recommend just buying it whole at the supermarket. You can easily rack up $10 with a few chunks of oranges and apples (my officemate hit $12!). So what can you actually buy then? Well outside of pointing out that you shouldn’t really be buying your lunches and dinners at these buffets, I will say that you do have some options if you have no other choice. Ok, the little list of good value foods is pretty bland and boring. But that doesn’t mean you’re reduced to eating cardboard for lunch. 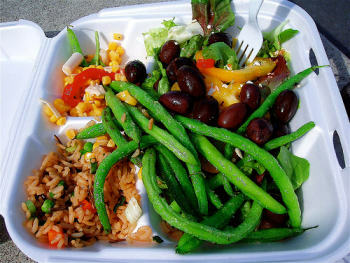 Instead, pick and choose your foods wisely so that you have a majority of “value foods” mixed with a few “yummy foods”. For instance, have a bed of lettuce, some tofu and green beans on the side, and some pasta salad or Chinese food (just one or two pieces). You get to savor the taste of the Far East while keeping some more cash in your wallet or purse. If you’re not sure if the food is a good value, just pick up a piece of it with the tongs or spoon and feel how heavy it is. Compare it to other dishes’ weights. For example, I wasn’t sure whether I wanted some Chinese chicken or lasagna, so I picked up a piece of each and decided based on which felt lighter. If you have the option of a large vs small container, go for the smaller one. Since you can fit less food inside the smaller container, you wont’ be tempted to get more food than you should eat or can afford. So to recap, while you can find more frugal lunches elsewhere, like PB&J sandwiches, if you’re in a pinch, you can still find a relatively good value at these “pay-per-pound” buffets bars. However, you have to be really careful in what you buy or else you’ll find that 2 pounds of bananas looks a lot lighter than it really is. Don’t let your eyes be bigger than your stomach, because the only loser is your wallet. Excellent! I’ve been covering the ‘pay by the pound’ racket in my classes for a couple of years (like your wife, I’m an RD) and feel that it’s very valuable (in more ways than one) information. Having worked the operational end of the food service arena, I know that these buffets are planned for maximum return on investment. Another tip: if it is a pay by the pound salad bar, either skip the dressing if your are getting it ‘to go’ and can keep dressing where ever you are or use simple oil/vinegar as it is the lightest. You should also be ‘skimpy’ with the high water content items like tomatoes and fruit and you can come away with a very healthy mix with a lower cost than if you bought all the different ingredients individually in the market. or, don’t go to the pay buy pound, b/c they are a rip off and your proposals are making you eat less healthy in order to maximize cost. also, avoid things like those olives that still have pits in them. I used to go to a salad bar at work and they had always had fresh fruit as the first item. Watermelon, orange slices, strawberries. It’s all water and some melons have the skin that you don’t eat. Also, they had these awesome california rolls that were the size of texas. Amazing, but so expensive. It would cost between $7-8 for a salad. I’m always surprised to see people loading up those styrofoam containers at my favorite Chinese buffet. All the foods on offer are quite dense and have plenty of sauce – which explains why I’ve seen a few people at the checkout with expressions of shock and then resignation on their faces – it’s not as if they’re going to put it back, and they don’t have the time to get something else on their lunchbreak. Thanks for spelling out some real tips for handling the pay-per-pound pitfalls. It’s all about estimating the cost/weight ratio. I try to find foods that are generally high-priced at the supermarket. Salmon, nuts, high-quality olives are all good examples. Most protein and salad without dressing is reasonable too. People making the big mistakes are those going for rice, pasta, dishes with heavy sauce, etc.